‘The Accountant’ is a preposterous action thriller that makes little sense if you stop and think, but I found it to be thoroughly entertaining and enjoyed it almost in spite of myself. It stars Ben Affleck as Christian Wolff, a mathematical genius who mixes up legitimate business operations with jobs for a variety of criminal enterprises as an accountant. Wolff suffers from autism which is used to partly explain his high functioning skillset and also to provide a backdrop to how he became the man he was, with flashbacks utilised to tell the story of his upbringing. The film picks up with him as he takes a job to investigate the accounts of a robotics corporation where funds have gone missing, whilst Treasury director Raymond King (J. K. Simmons) tries to track him down. It’s pretty clunky and exposition laden but something about the film draws me in and I really, really liked it. I can’t make my mind up if Ben Affleck’s performance is good or not; he’s fairly stilted in a lot of his delivery, which may be intentional for the character, but he’s also pretty funny in a slightly offbeat way and he’s got a presence particularly in the fight scenes when they come around. His character has a solid arc throughout the film and his scenes are always enjoyable to watch, but the same can’t be said for the law enforcement angle that really lags when it’s on screen, despite J. K. Simmons best attempts to imbue a series of expositional monologues with charisma. I particularly liked the tone of the film, which is just the right level of over the top and off kilter to enhance the ridiculousness of some of the plot developments. 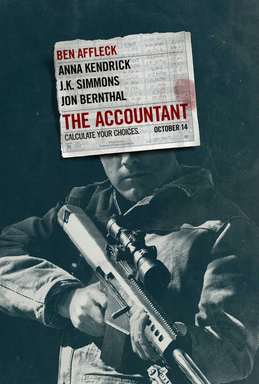 ‘The Accountant’ is very much a turn your brain off and don’t think too much about it kind of movie, but it’s definitely one of the best of these kind of movies. The supporting cast is pretty enjoyable, from Anna Kendrick to Jeffrey Tambor, to Jon Bernthal doing his perfect embodiment of wounded masculinity thing. The plot is far fetched and involves a convoluted conspiracy, but the actors embrace it and I was gripped by every development. ‘The Accountant’ is often muddled and unsure of which direction to take, but it’s also well acted, funny and well directed with strong narrative propulsion to hold your attention, and despite its many flaws, I enjoyed it immensely.